04	Life at Home During the War	"Enemy Aliens"
War fever created widespread hostility towards German Canadians and German-Canadian culture. The early part of the war witnessed a substantial backlash against many elements of the German presence in Canada. Public schools removed German language instruction from their curricula. Some orchestras refused to play German music. Winnipeg residents changed hamburgers to “nips” in order to sever the association with an enemy language. 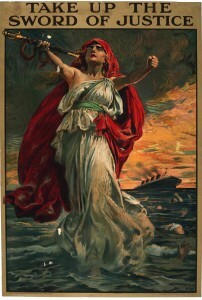 The sinking of the civilian liner Lusitania in 1915 with hundreds of civilian deaths seemed to confirm the popular view that Canada fought in a singularly noble cause against a nation of barbarians. Ugly riots in Victoria, Winnipeg, and Montreal targeted German-owned businesses and shops. 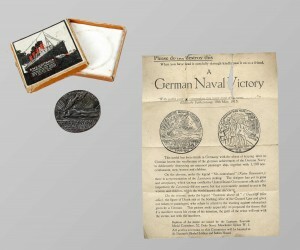 Anti-German propaganda, stories of German atrocities abroad, and fear of saboteurs drove many Canadians to demand protection from their government. Some 8,579 “enemy aliens” were interned behind barbed wire to remove the supposed threat, while tens of thousands more were forced to register with authorities and abide by stringent rules of conduct for the duration of the war. Sir William Otter, the distinguished Canadian soldier who oversaw the internment operation, stated that 8,579 “enemy aliens” were incarcerated in camps across the country. Otter classified 3,138 as “prisoners of war,” while the others were civilians. The majority of internees were of Ukrainian origin. Berlin, a moderate sized town in southwestern Ontario, was home to a large population of German Canadians and many Mennonites, a peace church that opposed military service. It became a focus of public unrest because of its name and the assumed disloyalty of many of its German or pacifist residents. Zealous patriots removed from its pedestal a bust of Kaiser Wilhelm I located in the city’s Victoria Park and threw it into adjacent Victoria Lake. Soldiers of the local 118th Battalion ransacked and vandalized German businesses. In early 1916, the local Board of Trade recommended that the city change its name as a symbol of patriotic commitment and in the hope that another name would be better for business. A municipal committee listed dozens of possibilities, including ‘Amity’, ‘Imperial City’, and ‘Hydropolis’, but overseas events provided another option. Great Britain’s minister of war, Lord Kitchener, was killed in early June en route to Russia when his warship struck a German mine. Only a few hundred local residents voted in the ensuing referendum, but those who did chose Kitchener. Berlin, which was not on the ballot, disappeared from the map on 1 September 1916. 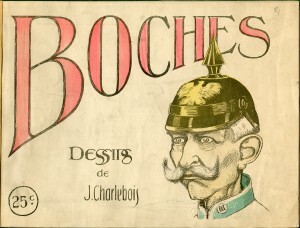 Periodic attempts during and after the war to revise the original name failed. 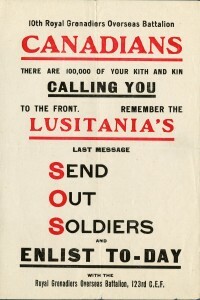 From the start of the war, most Canadians demonized the enemy. 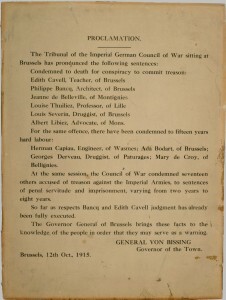 They believed the stories and rumours from overseas concerning German war crimes, and accepted without question what would mainly prove to be fabricated reports of German atrocities in Belgium, especially those involving women and children. News of heavy casualties and the use of a heinous new weapon, poison gas, at the Battle of Second Ypres in April 1915, galvanized public opinion against Germany and further convinced Canadians of the enemy’s fundamental barbarity. War propaganda reinforced enemy stereotypes and intentionally blurred the line between actual news and useful innuendo. Not all reports of German atrocities were fake or exaggerated. In May 1915, a month after the shock of Ypres, a German submarine sank the civilian luxury liner Lusitania off the coast of Ireland. Nearly 1,200 civilians died, including hundreds of Canadians and more than 90 children. 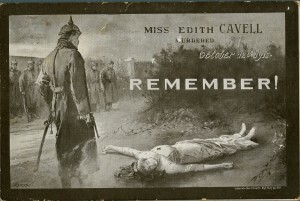 The Germans’ execution of British nurse Edith Cavell in October 1915 for helping Allied soldiers escape occupied Belgium further outraged Canadians and gave the war effort a convincing martyr. 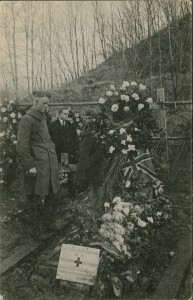 Cavell became the war’s most famous female casualty. In Canada alone, she had a mountain, several schools, a nursing institute, streets, and several hospital wings named after her. 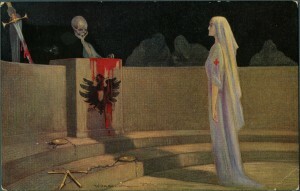 Wartime propaganda soon referred to German Kultur (culture) as a damning insult, a predisposition for war, cruelty, and destructiveness that placed Germany outside the community of civilized nations. 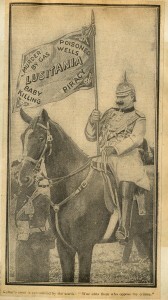 A total effort against such an enemy was more than justified, the imagery screamed: it was expected. 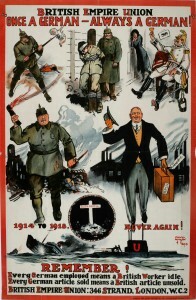 This fund-raising poster bears the caricatured images of Kaiser Wilhelm II, Field Marshal von Hindenburg, Crown Prince Wilhelm, and Admiral Tirpitz to deride the German war effort. 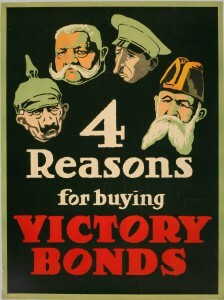 Anti-German sentiment proved effective in rallying support during fund-raising campaigns, like this one for Victory Bonds.